Strega Nona by Tomie dePaola was a favorite when I was about 5 or 6. None right now, but my next will be The Silver Chair by C.S. Lewis. I've read all up to that book and want to finish the series. Starting and not finishing or taking a long time between reads. Miss Peregrine's Home for Peculiar Children by Ransom Riggs and Game of Thrones by George R. R. Martin. 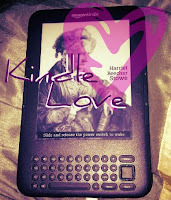 I have a Kindle and I love it. I rarely get the chance to sit and read at home so having something I can carry around with me and read when I have time is fantastic. I prefer one at a time, but I have a habit of reading two or three. I think I have tried reading more classics than I would have otherwise. I typically stick with books in certain genres, so I don't too often. Mostly fiction (Adult & YA) fantasy & sci-fi occasionally. Rarely nonfiction. I never take buses but if I did I would be able to fairly easily. At the beach, on my deck on a sunny day, in my living room or bedroom. I love sharing books as long as I get them back (hopefully undamaged!). I like to keep the pages as close to perfect as I can get them. I don't like my pages bent. I like to keep the pages of my books unmarked. I didn't mind those. They didn't matter as much to me as my other books even though I paid A LOT more money for them haha. The characters, the scenery, a good plot and storytelling. If I feel really strongly about how a book makes me feel I will usually recommend it. Fiction (Adult & YA), especially dystopian. Don't really have one, though there are a couple autobiographies that I liked reading. No, I don't remember ever reading any. I usually just use allrecipes.com when I'm looking for recipes. Or I love The Flavor Bible as a guide or Food Network Magazine, but I don't know that I have an actual cookbook that is a favorite. The Fault in Our Stars by John Green. I don't know that it is technically "inspirational" but it inspired me... and it's only March so I haven't read that many books yet this year. I don't usually spend the time reading a book because of hype unless it comes from a friend who has read the book and gives a good review, so my reading experience has yet to be ruined by any kind of hype. I don't read critic reviews. If I read a review it is by people who post reviews on amazon or another site. If a book is bad I don't feel bad warning other people (who may like the same things as me) against reading something. However, I know what I like, so I don't read a lot of books I wouldn't care for and rarely read books I don't like. Maybe French? It seems like it would sound more beautiful to read out loud. Slaughterhouse Five and 1984. I typically don't read classics and those were a little far out for me. Game of Thrones by George R.R. Martin. It is a little out of my normal reading comfort zone. I like Emily Dickinson (Hope is a Thing with Feathers is a favorite of mine) and Robert Frost. None? I have a kindle so I don't need to go to the library often, plus I can never get to my library because I work in another town and they are closed by the time I get off work. This only happened once or twice. I felt so bad about not having the time to finish reading what I checked out! I can't pick just one! So my top 2 would probably be Hermione Granger (Harry Potter Series) and Bilbo Baggins (The Hobbit). The dragon Smaug from The Hobbit. 40. Books you’re most likely to bring on vacation? Probably the books I've been putting off reading- Lord of the Rings & Hitchhiker's Guide to the Galaxy. 41. The longest you’ve gone without reading. I haven't read in a couple of weeks and that's probably the longest in years. I need to read more! Girl with the Dragon Tattoo. Everyone talked about how good it was but I was so bored that I couldn't read it! Practical Magic. The book was terrible... I couldn't stand the characters! They were horrible! The movie is fun. I can't wait for The Hobbit and The Hunger Games movies though! Dreamcatcher by Stephen King. Terrible. Maybe $30 or $40 on a splurge. I try not to buy more than 1 at a time or I probably won't read the book. I usually read the blurb and first couple of pages and sometimes the reviews before I purchase or start reading a book. Uninteresting plot, boring or bad writing/characters. I do. I tend to keep books by the same author together and books in a series in the correct order. If I really like the book I keep them because occasionally I'll go back and either read the entire book over again or my favorite parts of the book. If I don't think I'll ever want to read the book again I'll give them away to someone or donate them to the library. Not really avoiding, but books that I have yet to start. The Twilight Saga. The whole idea of a teenage girl being obsessed with a boy who stalks her and is really controlling and she falls apart when he leaves just annoyed me. A terrible example for girls. I read Winter Dance (even though I didn't think I would like it) because my husband suggested it. Breathless by Dean Koontz. It was really underdeveloped and it felt like the book was left undone. Poor plot. I like older Dean Koontz novels and was kind of upset with his current writing. As long as I enjoy what I'm reading it's all guilt free!